Nancy Pelosi was dressed to take on leadership role in the boldest, brightest, I-am-here shade of pink. At the start of the 116th Congress, fashion was not merely a footnote, it was a rallying cry, a defiant gesture, a point of cultural pride – a glorious, theatrical declaration of self. It was white suits and pink dresses, Native American artistry, a Palestinian thobe, a kente cloth stole, a hijab and a skintight pencil skirt with a fur stole. The main news story from Capitol Hill was, of course, the phoenix-like rise of Rep. Nancy Pelosi, D-Calif. 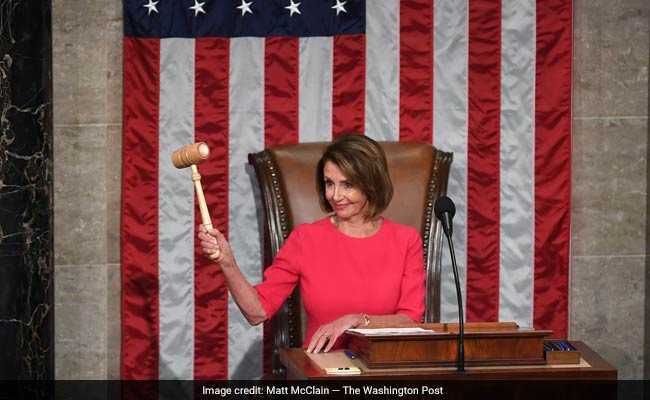 But even before she was sworn in as Speaker of the House, it was impossible to miss her as the television cameras swooped high and low over the sea of dark suits on the House floor. Alas, despite an influx of women – a record 102 in the House – men still dominate, and those men continue to favor a palette of navy, charcoal and black. Pelosi’s bright fuchsia dress was like the plumage of a brazen bird, one with the audacity not just to fly with the flock but to lead it. It was the aesthetic opposite of what she’d worn only the day before, when she went striding through the halls of the Capitol in a discreet suit the color of cement. This was an entirely different ensemble for a momentous day – one not just for the cameras, but for the history books. If there is any color that has ever come close to defining a gender, it’s pink. Culturally, it has long been assigned to girls. And for generations of women who were stereotyped and bullied into polite smiles and reassuring deference, pink was their bane. Over time, pink ribbons came to symbolize serious women’s issues – although typically discussed in soft and fuzzy tones.